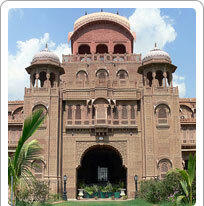 Lalgarh Palace In Bikaner Is A Marvel Of Rajput, Mughal And European Architecture In Red Stone. It Is Now A Luxurious Heritage Hotel And Has A Fantastic Collection Of Paintings, Weapons And Manuscripts. Maharaja Ganga Singh Ji made the Lalgarh Palace in 1902. His vision was given shape by the Britisher Sir Swinton Jacob. The Indo-sarcenic exterior of the Fort is complemented by lavish interiors, modern amenities, lattice and filigree work that are typical of the highest standards of craftsmanship this region, a large collection of paintings and trophies. The beautiful gardens are lush with bougainvillaea and peacocks have made a home in the gardens. The Lalgarh palace library is believed to have the largest collection of original Sanskrit manuscripts on parchments, copper and gold and silver plaques. Its museum even has a World War 1 Bi-plane. The palace is now partially converted into a heritage hotel managed by the WelcomGroup. The rooms that are a part of the hotel have been renovated extensively while retaining the old charm.